Top 10 Best Restaurants In Lekki - A Must See for Everyone. 1.1 Top 10 Best Restaurants In Lekki – Your Top List! Restaurants are business ventures that exchange food services for money. Lekki is one of the most affluent neighborhoods in Lagos. Lekki is one of the beautiful residential areas in Lagos and it is fast becoming a commercial hub with one of the busiest streets in Lagos, the Admiralty Way. There is quite a hand full of restaurants all around Lekki serving unique cuisines to titillate your palate. Listed below are some of the best and nice places to go to have a great meal in the Lekki Axis. 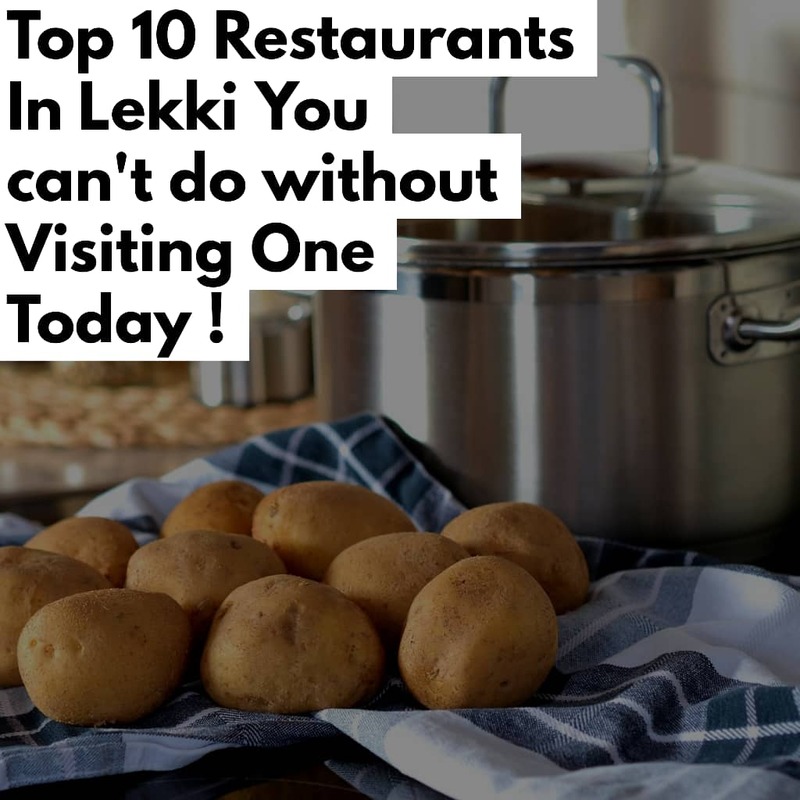 We’ll be focusing on Restaurants with preferences to the Restaurants in Lekki, thus, In this article, we’ll be writing on we’ll be listing the Top Ten Best Restaurants in Lekki you can go to and enjoy the best of meal in the area. Lekki is another major and busy hub in Lagos state and it is a lively and bustling business area because of the presence of high standard hotels when it comes to food, Lekki is a place to go enjoy delicious cuisine when there is the need because the town houses some of the best Restaurants in the city of Lagos. Take your time and journey with us and check out the Restaurants in the area as we also list out the Top Ten Best Restaurants in Victoria Island. Top 10 Best Restaurants In Lekki – Your Top List! Food is one of the basic and necessary needs of man, the restaurants in Lekki is said to be created for the belly and the belly for food. There are Nice Restaurants In Victoria Island as noted earlier. To have a great dining experience, check out any of these restaurants below. Location: No 1, Udeco Medical Road, Off Chevron Drive. This restaurant is popular for serving Afro-Asian delicacies. The meals served are in generous portions. If you love and crave for a Chinese meal, you can locate the Spicy Prawn Tempura for a starter and the meal is properly spiced. You could go for their main dish such as the Mandarin Fried with Shredded Beef Sauce. And if it’s a local dish you crave, you can be sure to be served the best and I assure you won’t be disappointed. Location: Plot 1 block 12, Admiralty Road, Lekki Phase 1, besides Daytona supermarket. This restaurant located along Admiralty Way has a lovely open terrace overlooking the ocean. It is frequented by locals and expatriates alike, it has an eye-catching view, a nice bar, and a good ambiance. The service rendered is excellent with meal options ranging from Nigerian to Continental. Location: Block A9 Plot 7, Wole Olateju Street, Lekki Phase I. This restaurant is known for Nigerian cuisine. From Pounded Yam and Ogbonno Soup to wheat and Banga soup and you will be sure to enjoy the best traditional cuisine that will make you lick your fingers. In fact, it is home away from home. Otresinterior is also very aesthetically pleasing. Otres’ has a classy ambiance and it is comfortable as well having quite a big space and you can host events there. In addition to its services, a lot of attention is paid to the details of plating and serving. The B-Hive Restaurant is one of the best restaurants in Lekki. It offers a mouth-watering local and intercontinental dish. The environment is neat with nice surrounding. The waiters treat you like royalty and you will definitely not regret spending your money in this restaurant. Delta Pot is one of the best African restaurants established within Lekki Phase 1 bringing Niger Delta to the people of Lagos by providing Delta local dishes such as Banga &starch, Owho & starch, Ukodo, Banga rice, coconut rice, Okro/egusi pepper soup, pepper rice etc. Location: 10 Admiralty Way, Lekki Phase 1. At Marco polo also offer and serve very good Chinese food. The restaurant is an upscale oriental cuisine where you can either sit and eat or take-away. The service rendered in this restaurant is very nice. The waiters make you feel like royalty. The Place serves as a restaurant, bar, nightclub, has three locations in Victoria Island, GRA Ikeja and also Lekki all in Lagos and it has established itself as one which has survived for many years. It has a bar/lounge which is opened every day from 5 pm, offering a providing a place for workers to relax, unwind and avoid Lagos traffic. The bar/lounge transforms is transformed into a major night club on Fridays and Saturdays. The Place is well known for its different dishes including grilled chicken, Asun, & Rice dishes. BlackBell Restaurant and Bar offers you the best food services in breakfast, appetizers, main course, pasta, salads, submarines, dessert cakes, wines, swallows, soups and drinks, pastries, and cakes. Your appetite will definitely be satisfied with the tantalizing dishes in this restaurant. This is also one of the best kitchens in Lekki Phase 1. The restaurant offers a high-class ambiance, the delicious menu comprising of goat cheese salad, pasta, pizza, steak etc and varieties of drinks. You are treated like royalty in this restaurant just like the name. Xovar Lounge Lekki is an entertainment center; with its Indoor/Outdoor Lounge established on a large expanse of land within the Lekki axis of Lagos. Xovar lounge is truly unique in its style. The architectural piece of this building is perfectly crafted to suit customers of all caliber having both an indoor and outdoor lounge. It’s a perfect spot to hang out. Xovar Lounge offers mouth-watering cuisines alongside a well-stocked bar with over 500 brands of liquor and a wide array of cocktails. Have you ever been to any of this restaurant before? If yes, I believe you had the best of experience. You have seen the Top Ten Restaurants in Lekki. The area also houses some of the best restaurants in Lagos due to the caliber and status of people living in the area. The restaurants in Lekki will definitely offer you the best local and intercontinental dish you can ever dream. You can visit any of the restaurants especially when you select anyone from this list and visitor hangout there to enjoy the best of Meals.